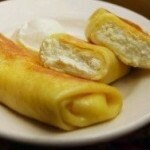 Cheese Blintzes are an Israeli food recipe of cheese stuffed pancakes. In a medium mixing bowl, make filling by combining cream cheese, cottage cheese, 1 egg, and salt. Beat until mixture is fairly smooth. Stir in raisins. Set aside. In another bowl, beat 2 eggs well. Add salt and water and stir until blended. Place flour in a large mixing bowl. Gradually add egg mixture from Step 2, beating well with a spoon to prevent lumps from forming. 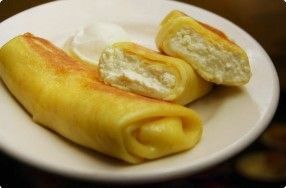 In a frying pan or crepe pan, melt 1 tbsp butter over medium-high heat. Stir melted butter into batter. Pour ¼ cup batter into pan, quickly swirling pan so a thin, even layer covers the bottom. Cook on one side only, until batter is dry and surface begins to bubble. Remove pancake from pan with a spatula and place on paper towels. Repeat with remaining batter, adding butter or margarine to lightly grease pan when necessary. When all pancakes have been cooked, place 2 to 3 tbsp filling on center of each. Roll up pancake and fold the open ends underneath. Melt any remaining butter or margarine in the pan and quickly saute pancakes over medium-high heat until brown and crispy.